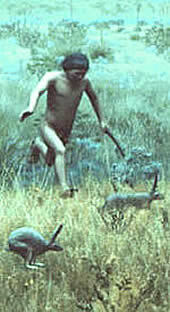 Hunting in prehistoric times required special skills, knowledge of the land and its animals, and the creativity to plan and carry out the hunt. With weapons and tools made with little more than sticks and stones, prehistoric hunters could stalk and slay almost any animal on land. 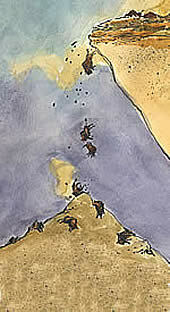 They also could spear, trap, hook, or net a variety of creatures in rivers and oceans. 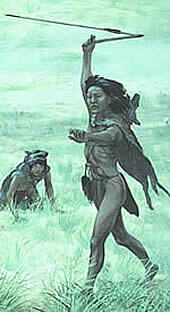 When we think of prehistoric hunters, the first weapon that comes to mind may be the bow and arrow. Archeologists, however, believe that Native American hunters began using the bow and arrow relatively recently, that is, around 1200 years ago in most parts of Texas. While 1200 years ago may seem like a very long time, consider that there have been people living on the North American continent for at least 13,500 years! 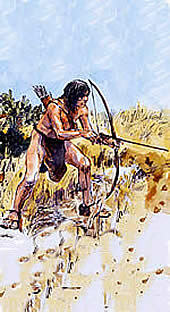 So, if prehistoric hunters were not using the bow and arrow, what types of weapons and strategies did they use during that enormous stretch of time? Find out by clicking on the pictures above. Kids Main |Fun & Games | Fantastic Facts | Adventures | Be a Scientist! | New Words!